This is our sixth episode on the German spring offensives of 1918, last episode we discussed the events of Operation Michael after the first day of the attacks, we discussed the decisions made by the Germans on how to carry their successes forward and the scrambling by the British to react to the German advances, that story continues today. This will be our final episode on Operation Michael and we will discuss how and why it slowed down and then eventually came to an end. Then we will look into the most important result of the attack on the Entente side, with Foch being named the overall commander of all Allied armies in Europe. Then we will wrap up this offensive by looking at the results in terms of casualties, territory, and what it meant for both sides. The German spring offensives are of course not over after Operation Michael and next episode we will continue the story of the attacks as the Germans shift their focus to the north and into Flanders. The German attacks had began on March 21st but by the 26th they were already starting to have serious problems. Part of the problem was on the German side, they were simply running out of men and energy. One of the big decisiosn that Ludendorff had made during the previous days was to continue the attack on the southern end of the advance and to give his armies diverging objectives. In the north the Germans had been almost entire halted, and in many ways the attacks there were put on hiatus until Operation Mars could be launched towards Arras, in the south the advance continued. The other reason for the slowing of the German attack was due to the reaction on by the British and French. The worst moments for the British had been from March 24th through the 26th because during this time the Fifth Aarmy was almost completely in retreat and was in danger of falling apart entirely. There were simple not enough troops in the area to reinforce the retreating units and so they continued. While this was occurring Haig and Petain would cooperate to try and save the front. By the time that Haig officially requested French assistance there were already 7 French divisions on the way, with more to come. Haig would ask for more, many more, but while Petain did not match his request he would send more with the total number of French divisions rising to 13. These divisions would solifiy the French side of the line and provide relef for the British forces who were retreating. This commitement of French resources was far greater than required by the agreements between Haig and Petain but, of course, Haig did not continue it to be enough. What he did not know, but what the French suspected, was that the Germans were preparing to attack in Champagne, and it would be launched as their third offensive of the Spring. While Haig did not get as many French troops as he wanted, 13 divisions would prove to be enough to help him stabilize the front. With the British able to stablize the front in the north, and the French able to do the same in the south, the Germans found themselves in a position that they were ill-prepared to handle. One historian would describe the situation during the last days of March as farcical with the British retreating at an easy walk while the Germans followed them at the same speed. The advances along some areas of the front continued to be massive, but at this point the British were not even attempting to resist. Everyone was tired, worn down, and hungry. For the Germans there were beginning to face the same problems that they had way back in 1914, as they pushed forward it became hard and harder to keep their forward units supplied. These supply problems were coupled with the fact that the only way to keep the momentum of the attack going was to sacrifice rest, and that price could only be paid for so long. Eventually the forward units would simply have to stop to get more than a few hours rest, human endurance has an upper limit. For the British there was some hope of stopping the German advance as they fell back to Amiens. Here the retreating British units would find that there were fresh British and French formations to the east of the city, and this presented the first solid road block for the German 18th Army since the attack began a week before. Since the British were manning solid defenses the Germans had to finally stop and wait for their artillery and reinforcements to catch up. This gave the defenders even more time to prepare and when the Germans finally attacked on March 28th their attacks failed. Then on march 30th they tried again, this time attacking along over 50 kilometers of front with an attack fo 22 divisions, and again it would be a failure. This was the moment when the Allies knew that the greatest point of crisis had probably passed, at least for the moment. Not content with the failure on the 30th, another German attack was launched on April 4th, this time with just 14 divisions, and again it was a failure. 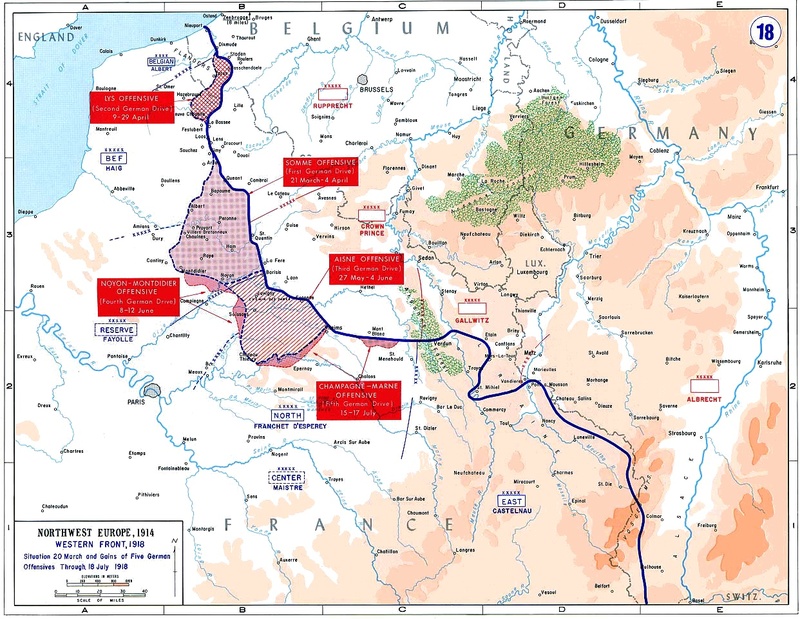 Here is John Keegan describing the stiuation on April 4th "On 4 April, however, the British added to their difficulties by launching a counter-attack, mounted by the Australian Corps, outside Amiens, and next day the German high command recognised that Operation Michael had run its course. “OHL was forced to take the extremely hard decision to abandon the attack on Amiens for good … The enemy resistance was beyond our powers.” The Germans put their losses at a quarter of a million men, killed and wounded, about equal to those of the French and British combined, but the effect on the picked divisions assembled for the “war-winning” Kaiser Battle went far beyond any numerical calculation of cost. “More than ninety German divisions … were exhausted and demoralised … Many were down to 2,000 men.”"
Let's dig into the problems that the Germans were having, at least for a bit. The Germans had advanced further and faster than any army had on the Western Front since 1914 when they had marched on Paris. However, in over four years of fighting they had not found a way to prevent themselves from making the same mistakes they had during those opening advances in August 1914. By the time that the offensive was halted they ahd advanced over 20 miles on a front 50 miles in length, however, thir advanced had slowed and then finally stopped, and they had not really gotten anywhere. Back in our first episode discussing the German Spring Offensives I made something of a big deal about how the Germans were advancing into basically nothing, this problem had gotten far worse when all of their effort had moved to the southern end of their attack. It meant that tehy were advancing and advancing and capturing nothing of real value. They had abandoned their original goals of the attack, which was simply to pull British reinforcements down from Flanders, they had spread out their effort in multiple different directions, and they had allowed themselves to be controlled and funnelled by the Allied defenses. To be clear on that last point, I don't mean that the British and French did a great job of stopping the German attack but they had found a way to funnel it in a specific direction. They had been able to trade unimportant space for time, while using available forces to make sure that the attack did not move to the north or south and into territory that had many strategic targets. Instead the Germans had been forced to advance through the borken terrain of the Hindenburg Retreat and then the Somme battlefield while the British and French sent their units to build defenses where it really mattered. They were hoping that the Germans would take this path, following the path of least resistance, and they did. For the Germans this was not necessarily the wrong call, but they were missing the one thing that would really let them capitalize on their enemy's weakness at this stage in the attack, they were missing any real form of pursuit. In earlier wars that would have been provided by the cavalry, riding down their retreating foes and preventing them from reasserting the defense. In later wars it would be provided by vehicles, usually armored, and usually tanks. But here, in 1918, neither of these technologies were seen as viable options for the Germans because they lacked the horses to make the cavalry option work and the technology to make the vehild option work. As so the Germans ran precisely into the same problems as 1914, they could pursue their foe, but at no faster of a pace than the British and French could retreat, and while all along the front the Germans exhausted themselves walking forward, their armies retreated back into their supply lines. It was only a matter of time, a time shortened by lack of supplies getting forward to the German troops at the front of the attack. This front was often blunted by units of hungry Germans finding British food and drink and taking a break to partake in the spoils. It should be noted that the original German plans accounted for some of these problems. Ludendorff had originally planned on Michael just being a quick burst of an attack before the German resources were moved north for another, but the German leadership had let themselves get sucked in by the allure of the huge advances they were making, sacrificing future efforts in the belief that this one would be a success. They essentially brought the defeat upon themselves by changing their plans into something that was simply not feasible for the German army to accomplish, by the first week in April they had paid for it with an offensive that had used far too many men and supplies for further attacks to be launched, but had gained nothing of real value. While the Germans were running out of energy and men Haig did not necessarily know that they were having so many difficulties. This caused a lot of communication between Haig and the other major players in the governments and armies on the Western Front. One of these was, of course, Petain, as we have already discussed. During their conversations, beyond just the British requests for French troops, there were also some discussions about what the French planned to do if the British retreat continued. The French army, and Petain, had orders directly from the French cabinet that were explicit, Petain would defend Paris at all costs and the defense of Paris would override all other concerns. What this meant for March 1918 was that Petain would have to retreat south and away from the British if the German attacks continued, and this meant that the two armies would be separated, with the British being left to fend for themselves. The moment that Haig learned of this plan is important because it caused him to reconsider the idea of a Supreme Allied commander that would be given control over both armies. Haig, and basically everybody else, assumed that if anybody was named to this command role it would be Foch, but he also believed that if Foch was in command of everything the British were far more likely to see a rapid increase in French support. Haig would clearly state in his diary that "In my opinion, it was essential that Foch should control Petain." Because of this belief Haig would send a telegram to Lloyd George in which Haig asked the British leader to reopen the discussion with the French with regards to an overall commander. While Haig was changing his mind about some things, the French leadership group was also having discussions amongst themselves. There were three main themes to these discussions. The first was the need to help the British, the second the requirement that Paris must be defended, and third that there was still a distinct possibility that the Germans were about to launch an attack to the south against the French forces in Champagne. This offensive would conceivably be designed to take Paris. This put the French leaders, with Petain, Foch, and Clemenceau being the most important, in a position where they were trying to balance all of these different priorities and each of them thought that the balance needed to be slightly different. The biggest disagreements were between Foch and Petain. With Petain wanting a conservative strategy which kept more troops in the south to guard against German aggression while Foch favored sending more troops north. Foch's push for more troops to be sent north increased as the Germans neared Amiens, which was critical and in Foch's opinion worth the greater risk to French defenses in Champagne. This balancing act would continue throughout the first days of the attack, but on March 26th the French and British would meet to discuss the idea of an overall commander. They would meet in the French city of Doullens, just a few miles from Amiens. The French representatives were President Poincare, Clemenceau, Petain, and Foch while on the British side were all of the British Army commanders, except for Gough who was a bit busy, plus Wilson and Lord Milner who had arrived from London. It would be Milner that would introduce the topic of naming Foch as "coordinator" of the British and French armies. The phrasing there is important, and initially Foch would just be a coordinator and would have a small fraction of the power that he would be given just a few weeks later. Everyone present was in agreement that this was good for the further prosecution of the war, and suddenly Foch was in charge, kind of. This would prove to be a critical turning point in the conflict, and Foch would play a decisive role in organizing and maintaining the momentum of the Allied armies for the rest of the war, especially during the 100 days offensives. The most important thing to remember from this meeting is that that British were the instigators in getting this agreement in place, the French did agree but without the British pushing for the appointment of Foch it may never have happened. We will discuss the ramifications of this agreement far more in future episodes. With the offensive halted, and the Allied armies now under a single commander, it is time to step back and summarize what happened during the two weeks of Operation Michael. The top level numbers for casualties and prisoners for each side are within these ranges, the British between 160,000 to 180,000, the French between 75,000 and 80,000, and the Germans between 240,000 and 250,000. While there is some pretty wide variance in those numbers, the general conclusion is that the offensive was roughly as costly for both sides. These numbers are quite large, and for reference they are about half of the casualties that each side suffered furing the entirety of the Battle of the Somme, and more than half of Verdun, but this was in just 2 weeks of fighting, whereas both of those battles lasted for over half of 1916. There was of course one big difference between those struggles, and really any other Western Front attack, and Operation Michael, the German attack had captured a sizeable portion of territory. 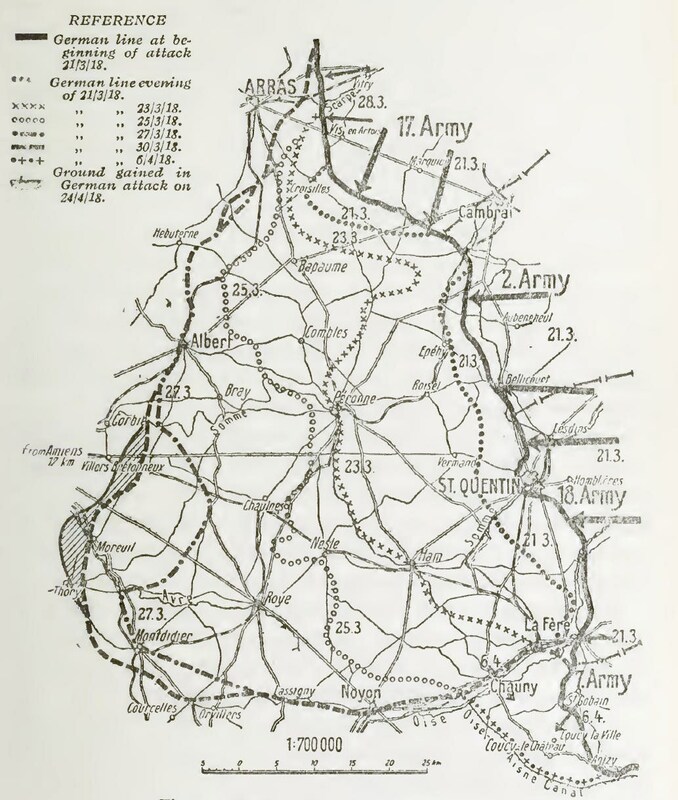 The Germans had completely overrrun the British lines along almost 50 miles of the front and on that front they had advanced roughly 40 miles. Overall they had captured 1,200 square miles, or 3,100 square kilometers of territory, but very few truly strategic targets. When trying to evaluate the overall success of the German attacks it is important to consider their goals. The stated goal of this attack had been to pull in British reinforcements from Flanders and Arras so that Operations Mars and George could move forward. To do this they would attack and then swing north, putting the British forces at the greatest jeopardy because the French, mostly to the south of the attack, would not be able to help them quicly enough. This goal was somewhat thrown away with the decision to reinforce success in the south on the second day of the attack. By making this change the French could suddenly play a much larger role in the defense, and it also made the objective of the attack more around territory than setting up future attacks. While these goals shifted, one thing that did not change was how the offensive was presented to the German soldiers who were taking part in it. From the name of the attacks, Kaiserschlacht, down to the expectations set with the soldiers, they believed that this would be a war winning offensive, or one that would setup the end of the war soon, and it wasn't. This caused an increase in cynicism, frustration, and overall disillusionment with the war. In this way I would actually compare it to the Neville Offensives of 1917, and while the German soldiers would not mutiny, the failure would deeply scar morale for the rest of the war. Then there was the matter of casualties. The best soldiers in Germany had been used in Michael, they were irreplaceable, and 250,000 of them were now casualties. While they had inflicted equal losses on their enemies by the first week of April 70,000 fresh troops were moving in from Britain every week and that did not include the American who were arriving in even greater numbers. Even though the Germans held vast swaths of territory, if Michael is considered a victory, then the Germans were going to win their way to defeat. For the British, they had clearly suffered a serious setback, they had lost all of that territory and all of those men, but, with the help of the French, they had not broken. 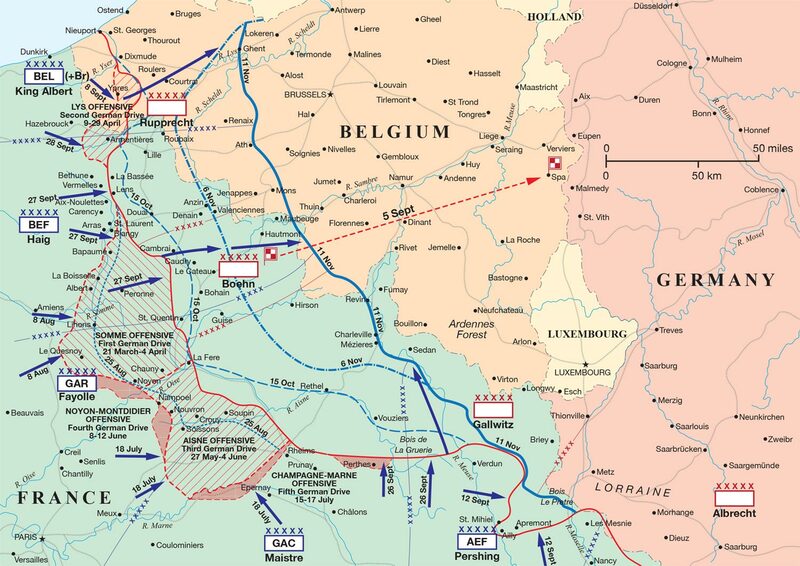 Sure, there were some seriously concerning days after the initial attack, but they had been able to recover and hold a defensive line outside Amiens to stop the German advance. While the offensive would definitely fall under the category of a defeat, there were some serious positive to what the defenders had accomplished. They had kept the Germans from capturing any objective of great strategic value. 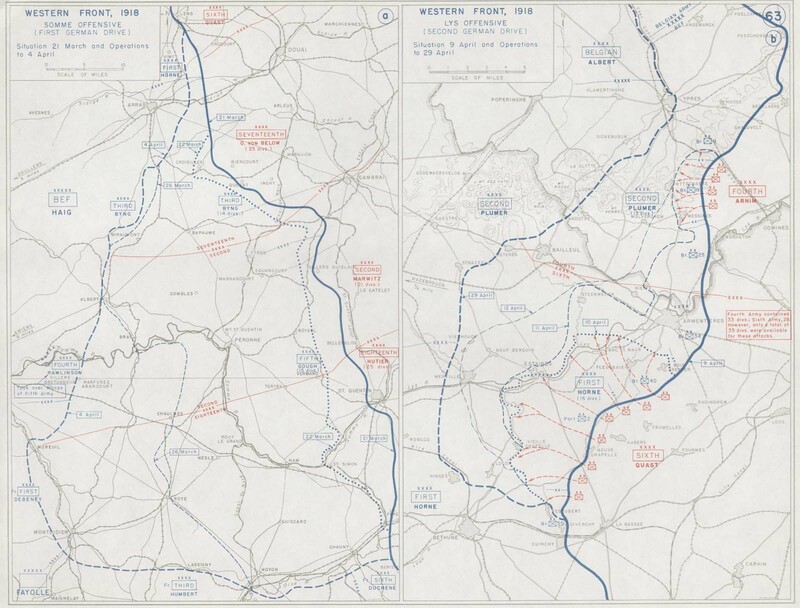 During the first few days they had prevented the northern end of the German attack from moving against Arras. Which the German attacks had shifted to the south the British, with plenty of assistance from the French, maintained a defensive line, even if it was moving back as fast as their feet could carry them. Then when the Germans got to an objective of value British and French reinforcemetns had arrived and prevented its capture. While all of this had been done on the battlefield, there were also improvemetns made to the Allied cause behind the line. I realize that we just talked about it, but the elevation of Foch to a position of command over all the armies was critical, and starting next episode you will find out why. So overall, Operation Michael had been a huge defeat for the British and French but within that defeat steps had been taken toward final victory. Before we end today, we have to close out one final story, and that is the story of General Gough. While there were positives in the defeat, it was still a massive defeat for the British army and there would have to be a scapegoat. There were several options, Lloyd George, General Sir Henry Wilson the Chief of the Imperial General Staff, even Haig, but all of these men were in political positions that were not easily dismissed and not easily replaced. Therefore it would fall onto General Gough to play the price for the failure, a failure that he had little control over. On the 28th of March he was relieved of command and he was back in England a week later. It was a disappointing end to the war for Gough and after many years of requesting an official review of his dimissal in the 1930s an investigation would finally happen. As a result of this investigation Lloyd George would write to Gough in 1936, telling him that he had done well in the fighting, later gough was created a Knight Cross of the Bath. The First World War would not be Gough's last and in 1940, which the German were once again poised to launch an attack against the British Gough would play a role in organizing the London Home Guard. He would survive his second war, and he would die in 1963, at the age of 92.